North Korea's Tae Ok Ryom and Ju Sik Kim compete during the pair skating program at the PyeongChang Olympics on Feb. 14, 2018. PYEONGCHANG (CNN) - They landed every jump, wooed the crowd and rose to the occasion. There was no gold medal to be won at the Gangneung Ice Arena on Wednesday, yet North Korean figure skaters Ryom Tae Ok, 19, and Kim Ju Sik, 25, received the sort of attention usually bestowed on champions as they took to the ice for the pairs skating short program, reaching Thursday's final with aplomb. Ryom and Kim are the only two of 22 North Korean athletes to have qualified for these Winter Olympics by merit, with their compatriots receiving special invitations following inter-governmental talks between the North and the South. While they are not expected to be on the podium, neither are they hopeless also-rans. Achieving a season's best 69.40 to qualify for the Thursday's final in 11th place, the North Koreans -- bronze medalists at last month's Four Continents Championships -- finished ahead of USA and Canada. They were brilliant. If North Korea remains one of the world's most authoritarian and repressive states, the duo express themselves openly through their program. They smile, they are emotive, they perform to The Beatles' "A Day in the Life." Naturally, there is intrigue. During Tuesday's practice session fans filled the lower section of the arena to watch the pair rehearse their spins and lifts and, for some South Koreans watching on Wednesday, it was an emotional day. Steve Ok, 30, from Seoul, told CNN Sport that he was "touched" by the performance. "We never have a chance to see North Koreans so it's surprising and interesting to see them," he said. Jaepill Choi, 21, also from Seoul, was watching athletes from the North perform for the first time. "Even though we're parted, we're family in history and, in our mind, we always try to congratulate the North Korean players and we want them to succeed at this Olympics," he told CNN Sport. "We don't have any offense to North Korean civilians, we just have offense to the North Korean government and we try to cheer the North Korean athletes." Security was heightened for the event, with police surrounding the arena, while outside the perimeters four young men and women held flags of a unified Korean peninsula and a banner which, in Korean, read "jump towards unification." Ryon and Kim, wearing black outfits with silver sequins, were welcomed to the ice by the North Korean cheerleading squad -- 229 are here to accompany the athletes -- enthusiastically waving PRK flags. There was no such fervor at this point from the rest of the audience in an arena peppered with empty seats. But that was soon to change. Dressed in matching red snowsuits and bobble hats, the all-female troupe, as transfixing as any Olympic performance at these Games, led the rallying cries for Ryom and Kim. Others soon followed. The decibels rose with each successful landing of an acrobatic jump. As the second verse of the well-known Beatles tune began, a song and a band that few North Koreans will have heard, the cheerleaders rhythmically applauded each twist and turn. By the routine's conclusion, almost everyone in the arena was clapping in unison. Before the score had been announced, there was a standing ovation from the cheerleading squad, who were flanked by minders throughout, while flowers and cuddly mascots were thrown onto the rink as a thrilled Ryom -- nicknamed the "Angel of Smiles" in the South Korean press -- and Kim curtsied and bowed. When the leaderboard flashed on the big screen, showing the North Koreans, who have been training in Montreal for a year, initially in second place, there was even more reason to cheer. "The cheering from the South Koreans and North Koreans together for us was very helpful," Kim told reporters. "We could really feel the power and the energy of the Korean people." Though the pair, 15th at last year's World Figure Skating Championships, did answer questions after their performance, they walked by members of the international press without stopping. There is no requirement for any athlete to speak to journalists as they pass through what is called the 'mixed zone" and, having already answered questions, they may have been oblivious to the desire of the crowd wanting to interrogate them further. "Though I'm Korean, it's my first time covering a North Korean sports team so it's fun," said Soyoung Park, a reporter for the Seoul-based newspaper The Joongang Daily, waiting among the media throng. "It's the same as covering anyone else, but I have some trouble because they are not talking about anything." A Japanese journalist, Takafumi Yoshida of the Kyodo News, said the North Korean pair were the source of great interest in his country because of the current political situation. It was only a few months ago that questions were raised about the viability of hosting the Olympics roughly 40 kilometers from the border after a year of escalating hostility over Pyongyang's ballistic missile program. On Tuesday, North Korean leader Kim Jung Un said it was important to further the "warm climate of reconciliation and dialogue" and praised South Korea for its "very impressive" and "sincere" efforts in hosting the North's high-level delegation during the opening few days of the Games. It has also been revealed that South Korea's government bankrolled the visiting North Koreans. 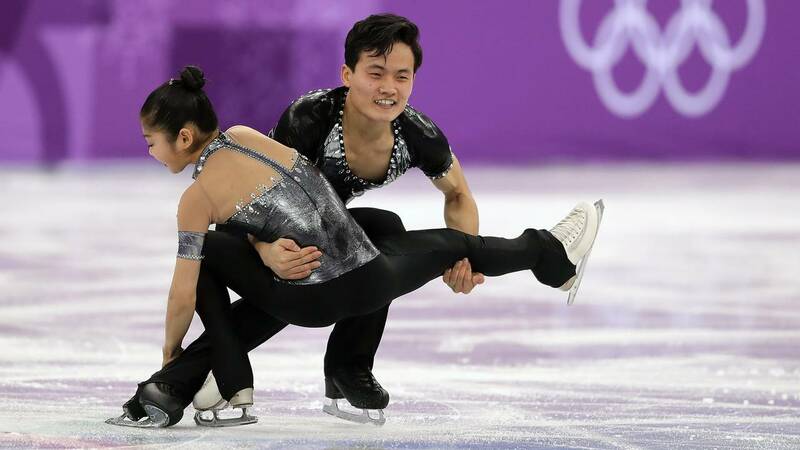 With South Korean pair Kim Kyueun and Kam Alex Kang Chan failing to qualify for Thursday's long program after an error-strewn routine, a North Korean pair who have captivated and intrigued will give the North and South reason to unite once more for sporting reasons.